Abundant Table, Inc. originated in November 2003 with very humble beginnings, only serving one person for a number of weeks. Now in our twelfth year of service, Abundant Table, Inc. is a federal 501(C)(3) tax-exempt,non profit organization consistently welcoming 60-80 guests, and newcomers every Wednesday and Friday evening. Additionally, Abundant Table, Inc. offers a “meals on wheels” program and delivers to three separate routes, serving 55 individuals each evening. different from most soup kitchens or meal programs, the Abundant Table takes a holistic approach to service, valuing and dignifying each guest. Adequate food, sound nutrition and socialization are imperative components to a healthy lifestyle and human survival. While most of our guests live in apartments or local boarding houses on subsidized incomes, a number come from group homes and have an array of developmental disabilities. These individuals hunger for socialization, conversation and an environment where they can engage with others, meet new people and feel pampered at a meal out. Abundant Table, Inc. also welcomes a number of homeless men and women who rely on our weekly meal as a cornerstone to their physical survival. Abundant Table, Inc. guests do not wait in a long line for their meal, do not sit at cafeteria-style tables or dine without conversation. 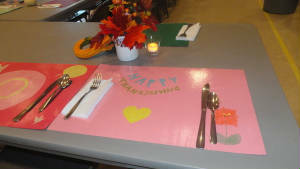 All guests are welcomed, greeted by name, seated and served in a restaurant-like manner. Volunteers sit with the guests while they dine, sharing in conversation and building relationships. Given the extreme volatility of the financial market, many of us are just one paycheck away from needing meal program assistance. That being said, we, as an Abundant Table team, commit to ensuring a judgment-free environment, where sincerity and empathy abound. In addition to serving in-house meals, Abundant Table delivers “meals on wheels” to homebound members of the community, supplies guests with non-perishable food stuffs to supplement food pantry allocation and offers a plethora of gently used/trendy clothing for guests to use for job interviews, gifts or personal use. To provide twice weekly hot, healthy meals for individuals and families in need. To make each guest feel like the only guest. To offer an outreach-based resource to the Norwood community, one that meets the socioemotional needs of local individuals and families.